DoingTimeWithBernie.com: Did felon Bernard Kerik inspire the corrupt commish character in the must read novel of the summer, "Badge of Evil"? 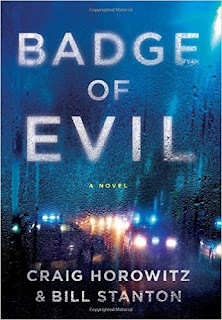 Did felon Bernard Kerik inspire the corrupt commish character in the must read novel of the summer, "Badge of Evil"? Novel,"Badge of Evil", written by former NYPD cop turned private detective, Bill Stanton, and esteemed New York journalist, Craig Horowitz, is published by Judith Regan and Regan Arts. The mere mention in reputation of those infamous Metro NYC names tells anyone this novel is destined to be one dynamic crime thriller! I read an excerpt and now I can't wait for the Kindle download! Even more enticing is the connection and history between the composite characters in the book and the real life formulators of "Badge of Evil"! So we all know Bill Stanton from his private security to the stars and his accompanying Judith Regan in the successful mission to liberate her divorce files from the grips of a horrible divorce attorney once relieved of his duties. We know Craig Horowitz as the writer of one of the best articles describing the "storm that wrecked" Bernie Kerik's career. And we all know Judith Regan as Bernard Kerik's book publisher to the very successful 2001 memoir, "The Lost Son". Oh, and yeah, there was that extra-marital double affair with Bernie cheating not only on his wife, Hala Kerik, but also with and on another long-time lover, City Corrections Officer Jeanette Pinero, culminating in a nasty breakup when Judith found out Bernie was lying to her about Jeannette and the status of his marriage. Oh, and yeah, there were those $5million reasons in that nasty Fox News law suit where truth about Bernie Kerik was on Ms. Regan's side.